and/or having Nursing degree they are eligible to apply online for this TNMRB Nurses Jobs recruitment 2019. Online applications are accepted for these Nurses posts from 06-02-2019 to 27-02-2019. An objective type written exam will be conducted for this Nurse Posts for 100 marks. Exam Pattern and Exam Syllabus PDF is attached with this notification below. TNMRB Nurse Exam Syllabus will be Diploma Level nursing course only. Age limits, Nurse selection process, TNMRB Nurse Online application form, TNMRB Nurse recruitment Exam pattern and Syllabus, other details are mentioned below. 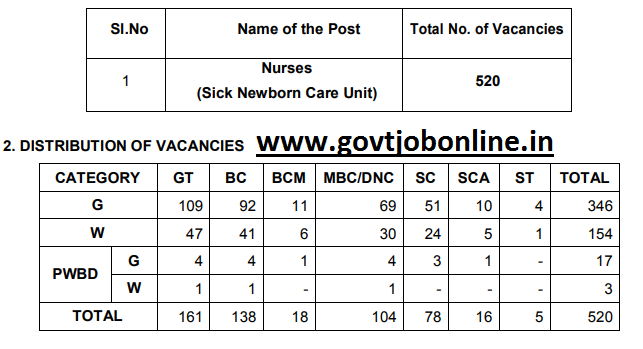 There are total 520 posts are in this Nurses Male/female posts recruitment of TNMRB . For female candidates 154 posts are reserved. 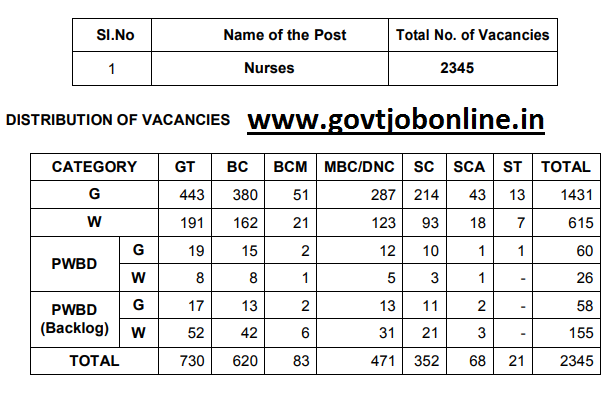 There are total 2345 posts are in this Nurses Male/female posts recruitment of TNMRB . For female candidates 615 posts are reserved. Upper age limit is 32 years for this TNMRB Nurse Posts recruitment 2019. For Reserved candidates upper age limit is 57 years. GNM Diploma or Nursing Degree having candidates is eligible to apply. Must have registered with Tamil nadu Nursing council. Pay scale for Nurse Post is: Rs.14000/- per month. For General or UR candidates application fee is Rs.700/- and for all the others Application fee is Rs.350/-. An objective type OMR based test will be conducted for 100 Marks for this TNMRB Nurse jobs recruitment 2019. Written exam will be conducted for 100 marks. Total 200 questions will be given and exam duration is 150 minutes. Minimum qualifying marks for general candidates is 35 marks. For others minimum qualifying is 30 marks. Candidates can apply online for this Nurse jobs via official website of Medical Services Recruitment Board of Tamil Nadu State through http://www.mrb.tn.gov.in/. TNMRB Written Exam date, TNMRB Exam Syllabus, TNMRB Nurse admit card release date and other details are available in this website only.